More than 10,000 people have been gathering at a 17th Century Dorset castle for an alternative summer music festival for families. Rock and roll legend Chuck Berry, singer Kate Nash and alternative band The Flaming Lips are the headline acts at Camp Bestival at Lulworth Castle. The organisers of the annual Bestival on the Isle of Wight are behind the inaugural three-day event. But the music stopped for one hour on Saturday - for a local church service. The festival is aimed at "yummy mummies" with boutique camping. Organiser and DJ, Rob da Bank, said: "We feel there's not a show out there with a really great musical line up and where your children can enjoy it too - Womad, Guilfest and Larmer Tree do it, but for a different market. "I'm sure there'll be some yummy mummies but also some freaky daddies, grown-up babies and some rave children. The more mixed up the better for me." About 3,500 children were expected at the festival taking part in sports day, story telling, jousting and dressing up. 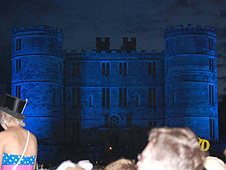 The event was inspired by the British 1950s holiday camp experience complete with the Bestival Bluecoats. 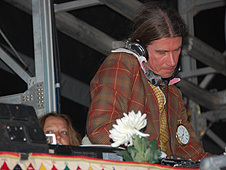 Saturday's line-up included Billy Bragg, up and coming band Black Kids, DJ Yoda, Dexys Midnight Runners' frontman Kevin Rowland on the decks and headliners The Flaming Lips. But as part of the deal to host the event, general manager James Weld insisted that the music stop to allow for his local Catholic church service. "It's great to have an opportunity to run a music festival at Lulworth particularly one aimed at families," he said. "Being a catholic family we were glad we were able to agree with Camp Bestival that the service could continue in the festival. "I was very impressed that everything stopped to allow it to happen." Kate Nash was due to take to the stage on Sunday along with DJ Rob da Bank.